As the game’s title first appeared onscreen and the music started to play, Death’s Gambit immediately had my attention. After waiting so very long to play what I knew to be another “Souls” styled game, I was happy to see this game was ready to show me what it was doing differently right away. The title screen plays a score that is filled with emotion, but not necessarily the ones you would associate with its inspiration. A song sounding of hope and redemption filled the room, and I knew I was in for something special this time. 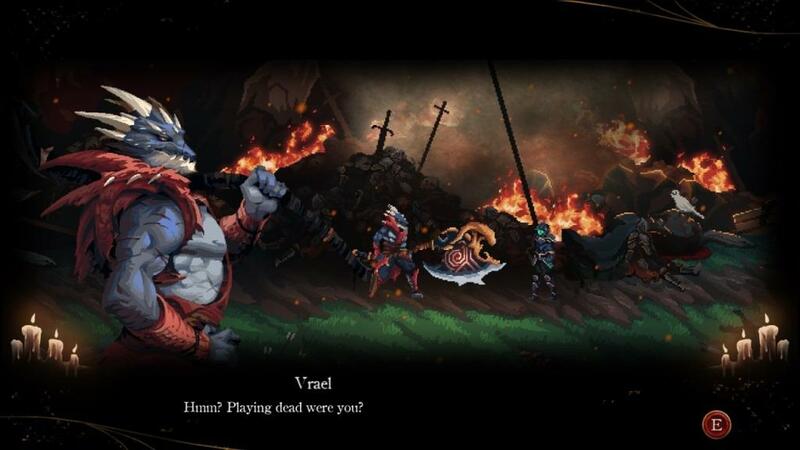 Death’s Gambit is a 2D side-scrolling action adventure with a large focus on challenging combat/bosses, non-linear exploration, and a compelling narrative. Being heavily inspired from the massively popular Dark Souls series, this is not the first game to serve up such an experience (Even in the 2D perspective). You play as a knight (Sorun) who has recently avoided having his corpse thrown on a pile by being brought back via contract from Death himself. Sorun is tasked with making his way to a relic that is causing rampant immortality and destroying it (Death doesn’t take kindly to this imbalance of life, naturally). As the game progresses, Sorun’s story unfolds in this mysterious land and he meets friends and villains with their own history and motivations (All of which are well written, and none of which will be described in detail in this review). The game starts off with the player choosing a starting class (or Soul, as the game defines). The choices at first seem like simple decisions of starting equipment, but each Soul has a focus on different modes of play to gain “soul energy” for casting spells and using skills. I chose the assassin, which gains soul energy from dodging attacks. Other options were the Soldier (who gained soul energy from blocking attacks), the Sentinel (who can equip any weapon or shield with only half the stat requirement, gaining soul energy from parrying), and the Acolyte of Death (who is able to restore broken death’s idol statues, giving the player who chooses this Soul more checkpoints to rest and save at). Mortality is a theme that runs through the gameplay and story. Immortality being conveniently bestowed upon the player by death is openly discussed by characters you interact with: enemies included. I found this incredibly amusing and caught myself laughing out loud at some of the audacious circumstances that come up as a result. Hearing a boss remiss at Sorun’s unrelenting attempts was comical, and having scenes play out differently based on if/when a player fails an encounter made me wonder what would happen if I succeeded or failed differently on subsequent plays. Having the world understand and recognize Sorun’s inability to die completely changed how the game’s plot played out compared to most games, and Death’s Gambit is better because of it. After completing my first play through, I found the bosses to be tough, and mostly fair. Their health bars are marked with notches that show when they transition into more aggressive phases, which increase both in intensity and move sets. The attacks being thrown at the player are relentless, but a clever use of advanced warnings in the form of skull icons will help players move intelligently and learn the abilities as the combat continues. However, too often it felt like the stamina bar was exhausted when I needed it the most during these major encounters. 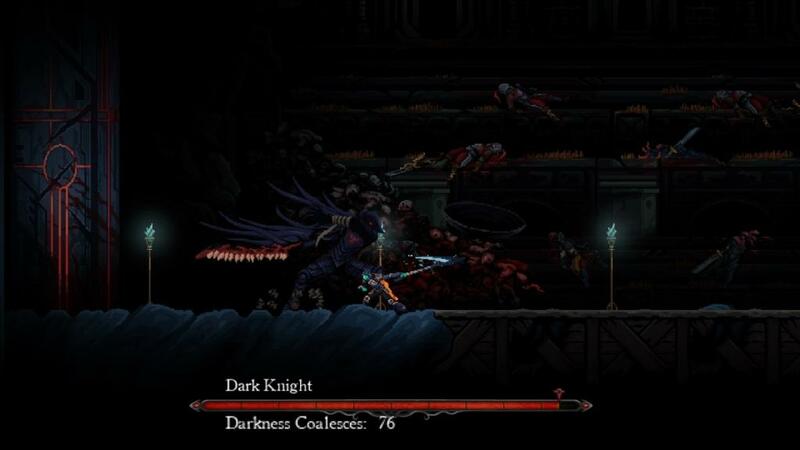 Attacking after a flurry of dodges and blocks in a boss fight was often the most difficult component of the battle. Not all boss fights were strictly based around draining health bars to win the day. Variety was impressive across your immortal foes in Death’s Gambit; rarely did mechanics feel copied from one to another, making for fresh and memorable confrontations throughout. Unfortunately, the game does suffer from random crashes and some bugs at launch. No fewer than a dozen times did my game completely fail; most of the time without any warning or apparent reason. At the time of this writing, the final boss’ trophy (awarded for beating the game) does not pop and is a known issue. That being said, the overall quality of the game kept me replaying through any lost progress. 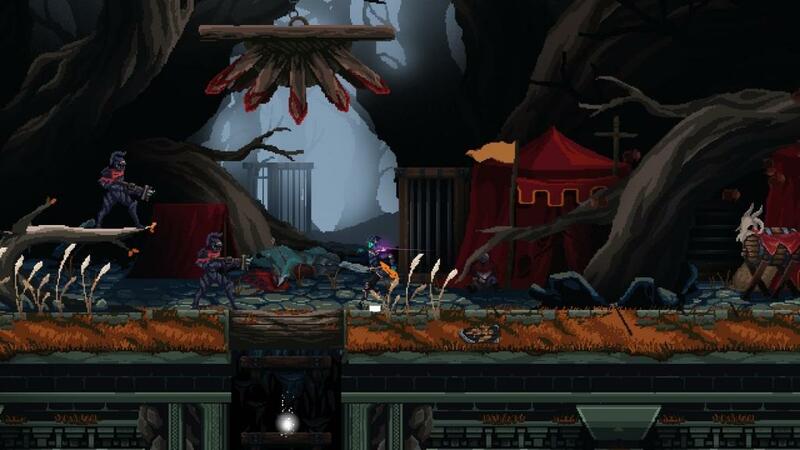 I happily drowned my annoyance away with Death’s Gambit’s solid gameplay and beautiful pixel art. Ultimately, Death’s Gambit is an excellent homage to the many metroidvania and Dark Souls titles that it draws inspiration from. Rewarding exploration with carefully placed treasures (and enemies to guard them), I found myself revisiting areas to completely explore nooks I may have missed. Leveling up to use new gear, do increased damage, or expand stamina and health bars is satisfying and helps smooth out the difficulty spikes on any bosses you may be stuck on. Even after the end credits were rolling, I found myself considering what different classes would feel like, what different choices I could make next time, and which order I would approach the bosses in. This is a journey well worth experiencing, and I hope to experience it again myself sometime soon.